Today the SD Association (SDA) has taken the wraps of its new microSD Express standard for mobile devices. The new memory card standard has been introduced alongside the SD7.1 specification which describes the incorporation of the PCIe NVMe interface to the legacy SD interface in the microSD form factor. To recap, the SDA launched full sized SD Express cards, and SDUC cards with capacities ranging from 2TB to 128TB, back in June 2018. Like the full sized SD Express cards the microSD Express uses the PCIe interface to deliver up to 985MB/s data transfer rates, and the NVMe upper layer protocol enables advanced memory access mechanism. A subset of cards will be available based upon the new SD7.1 spec including microSDHC Express, microSDXC Express and microSDUC Express. 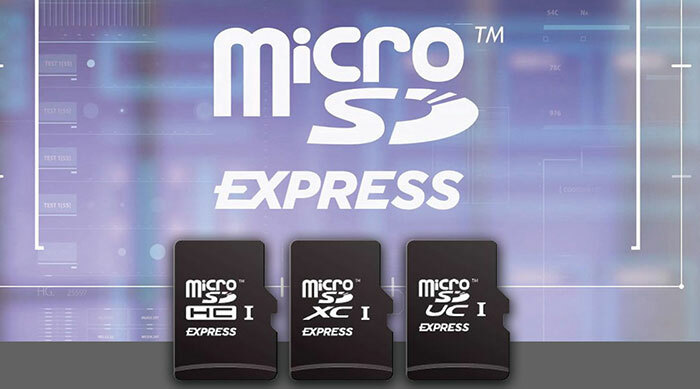 The significant speed boost and improved interface in (micro)SD Express leads to the SDA referring to its new crop of memory cards as "removable Solid State Drives". The release of these faster new cards will open new opportunities for device makers and facilitate new levels of content creation (super slow-mo video, RAW continuous burst photography, 8K and 360 degree video capture and more). 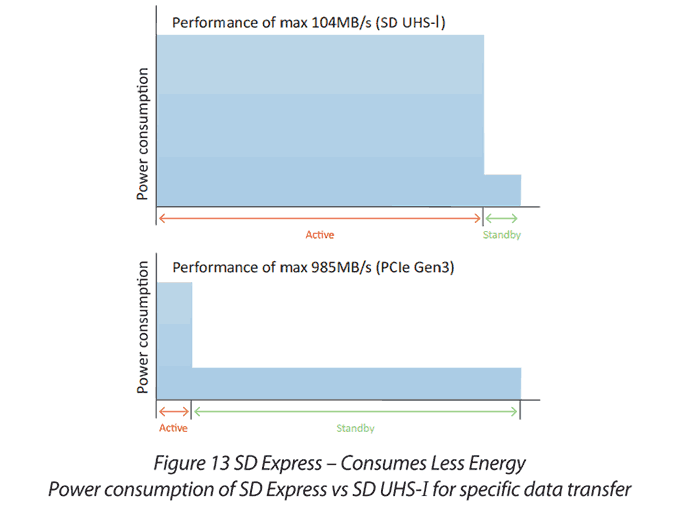 As well as the performance benefits, microSD Express should mean energy consumption is reduced - they have the same maximum consumed power levels but can complete transfers much faster. Additionally PCIe and NVMe capabilities, such as Bus Mastering, Multi Queue (without locking mechanism) and Host Memory Buffer open up opportunities for mobile hardware / software developers. Last but not least, microSD Express cards will be backwards compatible with older microSD card hosts, with fall-back transfer speeds of up to 104MB/s. White paper PDFs covering SD Express Memory Cards with PCIe and NVMe Interfaces, and the SD Express and microSD Express Memory Cards: The Best Choice for Your Future Product Designs are available via the links. microSD Express should mean energy consumption is reduced - they have the same maximum consumed power levels but can complete transfers much faster. You can't be more obvious xD. If you send something like that to me in email, I would feel insulted. Anyway, I am interested to see that in mainstream. Would like to see speeds of write not just read as this is more important for burst RAW, slowmo capture etc. I hope they've not made the mistake of OCZ in early SSDs. High sequential rates for marketing but at the total expense of random read/write. Whilst this isn't critical for the purpose, there will be uses requiring this and I hope it hasn't been totally abandoned for these headline figures. Given phones are now coming with a decent amount of NAND I can see that these are big file storage rather than OS / application storage systems first but me, I like to have everything. I agree that OCZ did make many mistake in the specs of those early SSDs (I lost data when one abruptly stopped working), and in PC or laptop boot drive you need good random access performance for both reads and writes, but for MicroSD cards the target market is different, and random small block I/O is quite unusual. 1. Professional and prosumer still and video camera users. These people want large capacity cards with the fastest possible sustained write speeds. If you are shooting 4k60 on the latest GoPro, then the card needs to keep up with high speed writes of large files. This is the market that the SD Association are primarily targeting because they are the first adopters and their dollars pay for the new technology that will eventually trickle down to other groups of users. 2. Consumers who want to expand the storage of digital cameras, phones and tablets for media files. The priority here is low prices with acceptable performance. There will be a mixture of reads and writes, but mostly large files, as these days all phones & tablets have enough internal memory for apps, so there is no need to run them from removable storage. 3. Security cameras, dashcams etc. The priority is for write endurance rather than speed. A dashcam will typically fill and overwrite it's memory card 2-3 times per day, but consumer flash devices typically have an endurance of only 100 full writes before they wear out. Write endurance optimised cards cost twice as much per Gb, but will last much longer. 4. Raspberry Pi and similar dev boards. This is the only category where random small block I/O is important because the MicroSD card is being used as an OS boot drive. It is the smallest category of the market, and probably the hardest to serve because it's needs are so different. Yeh that's why I expect it'll be optimised for sequential throughput and headline figures, probably at the total expense of / disregard for random speeds. I'm sure there will have been a sensible balance that the engineers would have come up with and the marketing department will have wanted the big numbers to pop on the box. That's the mistake OCZ made apparently (and J Micron if I remember rightly) and is why IOPS became such a useful measure for real world SSD performance. As you say, different target market and use case. Myself I certainly put my micro SD cards through way more than 100 full write cycles. I'd say this one I'm currently using has been through at least 300 cycles so far. Doing pretty well. I usually fill it over about 3-5 days and wipe it and it has been running for maybe 5 years now. If you're using a dev board / Pi I think you generally do accept the limitations of the device and storage media… doesn't stop me wanting it all. I think if you're using this kind of thing you just have to accept you're basically employing a storage technology in a use for which it was not designed. Doesn't stop me stomping my feet and going “but I want!”.